like bar and clubs? are they packed friday,saturday nights? and single people ? I am trying to relocate somewhere from NYC. 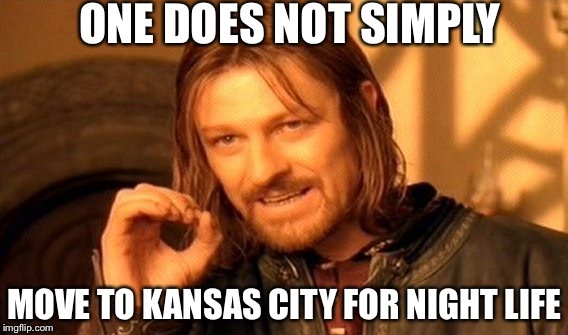 I'm not an expert here, but my take is that Kansas City is pretty average for night life. Compare to St. Louis, Pittsburgh, other mid-sized midwestern cities. I hope you have other criteria besides nightlife for relocating. Then again, perhaps you're a DJ or someting, and nightlife is really important to your livelihood. In that case, I'd look at much bigger cities like Chicago, or cities known for their nightlife like Las Vegas or Miami. One does not move to Kansas City for the night life alone. It's been a few years since I was actively involved in the nightlife scene regularly (marriage and baby and all), but my experience is that is pretty much on par with that of similarly sized cities in the region. No shortage of bars, a number of different neighborhoods catering to nightlife, of varing characters (bro-sorority style, hipster, artsy, GLBT, faux "speakeasy," music genre focused, suburban sports bar style, etc.). I was never a clubber, per se, stuck mainly to bats that maybe also had dance floors. I'm sure club type places are out there. The biggest hindrance to the nightlife scene, IMO, is how spread out the entertainment areas are. You basically have to drive/ride between, say, P&L and Westport and Waldo, esp. After a certain time. Now, I assume that Uber comes into play, but a few years back, you just stayed in whatever 'you'd you stared out in. Perhaps the taxi scene had changed, though. That's one way the Streetcar is poised to make an impact, as it contemplates extending to Westport and the Plaza. Well, the Friday night crowds on the streetcar are quite Power and Light oriented. At least it's a joyful crowd. Not sure what you mean by "Power and Light oriented". Meaning, they park elsewhere and ride to the P&L district? Or they live near the streetcar line and ride to the district? I read it just as Power and Light is a main destination for those using the streetcar on Friday night. More of what TabulaRasa stated. More specifically, what you stated would probably highlight the exact situation. Whenever this is extended to the Plaza, so many people will use it to travel from Midtown to downtown and others going the opposite way to Westport for a night out. I would expect ridership to far exceed the current 6,000 daily riders.